Without doubt the Golden Buddha is an astonishing image, but more the exhibition centre is entertainment for all ages, a must see! The Yaowarat Chinatown Heritage Centre is interactive, demonstrating the history of "Chinatown" and how the Chinese community influenced Bangkok through the centuries. It's highly recommended to absorb the history and culture of the area. Sitting serenely atop a pedestal in Bangkok’s Wat Traimit Witthayaram is what is said to be the world’s largest solid-gold Buddha image. The dimensions of the ‘Phra Sukhothai Traimit’ statue are impressive enough – more than 3 metres tall and weighing in at over 5 tons – but it is the story behind the image which makes it more remarkable. 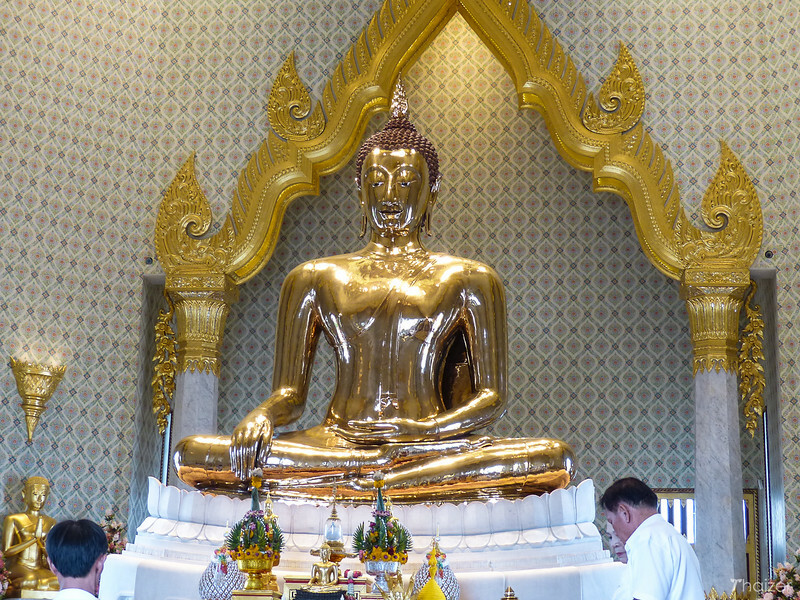 The Golden Buddha image is about 900 years old and is cast in the Sukhothai style. It is believed to have been brought first to Ayutthaya. When the Burmese were about to sack the city, it was covered in plaster to hide its value. Two centuries later, still in plaster, it was thought to be worth very little. The venue comprises several levels, exhibition centre and prayer room (Golden Buddha). Admission cost: Nominal: (100-200baht) prices split for Exhibition and/or temple (prayer room). exit gate 1 (Wat Traimit), follow the signs or ask locals.